So it’s more than a little interesting that Rupert Murdoch, proprietor of that Orwellian behemoth News Corp was born with the Sun in sweet Pisces. He’ll be celebrating his 80th birthday on March 11. Murdoch’s News Corp, as no doubt you’re aware, owns Fox News, The New York Post, The Wall Street Journal, The Times, The Sunday Times, The Sun, most of Sky Television, most newspapers in Australia, etcetera, etcetera. It’s arguably the most influential news media group on the planet. So what does it mean that this plutocrat has a “gentle” fishy Sun? Traditionally, Pisces does have two sides – the minnow and the whale. I think we can safely say we have a whale-type here, opening his giant maw to sift and change the oceans of our dreams. Murdoch’s chart is pretty liquid, which one expect from a mystic, a dreamer, an actor or a poet. He has a mix of all the elements, but the emphasis is clearly on water, which rules the realm of feelings. To clarify, not only does he have five planets in Pisces and Cancer, he also has six planets, including Sun and Moon in the water houses – 12, 4 and 8. So how does these supposedly sensitive placements create a mega media mogul? News Corp is not based on providing news, but on manipulating how we feel. Fox News, the Sun and their stable mates directly address our feeling nature, not our thinking nature. That is how the water works for Murdoch. His media monolith speaks directly to our dreams. Thanks to the water, Murdoch’s instinct is probably infallible. He must have an almost mystical grasp of what the public wants and how to feed it to them. This last is thanks in part to his Sagittarian Moon in the 12th house of the collective unconscious. The Moon is his instinct (in the sign of broadcasting and publishing), so he is plugged right in to the collective. Some people would say that he is in tune with the lowest common denominator. Fellow Pisces Einstein puts his finger on it. Pisces’ modern ruler Neptune is the highest planet in Murdoch’s chart, embuing the rest of the chart with its glamour from the 9th house of broadcasting and publishing. He doesn’t have a problem with the vision thing then does he? He is able to dream big, all-encompassing dreams. Rupert Murdoch has tht thing which so many money types are completely missing: imagination. And what an advantage that hs given him. This also chimes in with the Sun in Pisces conjunct Mercury, planet of communications, which interestingly is in detriment. Apparently, he’s not especially articulate in person. If this chart were simply watery and Neptunian, one might expect to see this person drunkenly floating along on a boat, lost in a dream world of his own, but the wateriness is grounded and vitalised by some powerful earth and fire – and the chart is dominated by a dynamic Cardinal T-square. Murdoch has the CEO earth sign, Capricorn, on the ascendant, so he’s a natural leader. With Saturn rising, and strong in its own sign, he is the Daddy. Notably, News Corp is a family affair with three of his children having run various bits of the enterprise. This configuration also means he’s always had an old head even when he had young shoulders. He took over the family business when he was just 22 years old and since then he has always been in charge. Now that he really is an old man, he’s fully come into his own – rather a terrifying thought. That Neptune trines his ascendant and quincunxes money planet Venus in airy Aquarius in the house of money. Well, we know he’s never been short of a bob or two. He must like intelligent women. In fact, I expect he can’t bear stupid people. It’s a very egalitarian placement this: I bet he despises snobs and any discrimination based on anything other than talent and guts. The dominant pattern in his chart is a cardinal T-square that zaps between Cancer-Aries-Capricorn. Cardinal signs lead from the front. At their best, they are decisive, inspirational and good at strategy. At their worst, they are dictators. Murdoch’s chart data is from Astrodatabank. The point of the T-square is Uranus in Aries conjunct the destiny point or North Node. This is the signature of the revolutionary. In this country, Murdoch revolutionised the newspaper industry by introducing computer technology (ruled by Uranus also) in the 1980s. There were riots in the streets of East London when he sacked 5000 printworkers. A few years later, hot-metal printing was finished. Who would have thought that 25 years down the line, we’d be watching the death throes of printed newspapers altogether? Creating change is Murdoch’s destiny, which, of course, comes easily to a flexible Pisces. And with the cardinal T-square he will constantly be driving change. He’s 80 this month and yet still pursuing a huge satellite TV takeover in Britain, possibly the biggest of his career. This Uranus placement and the Moon in Sag, combine to make Murdoch an very effective risk-taker. With Cap on the ascendant all his risks will be calculated. I’d be surprised if ever gambled unless he was sure he’d win. He’s not afraid: he has Jupiter, Pluto and Mars in a wide stellium, with Mars at home in the 8th. That also makes him totally ruthless. Andrew Neil, his right-hand man at News International back in the 1980s called him, “The most inventive, the bravest dealmaker the world has ever known.” I can see that. The T-square is a common pattern in natal charts but nevertheless a difficult one to cope with. In Murdoch’s case, its tension is released through Sun-Mercury in Pisces, in other words through his imagination and his ego. Murdoch has some interesting transits at the moment. Power planet Pluto has been hovering over his ascendant since about 2008. 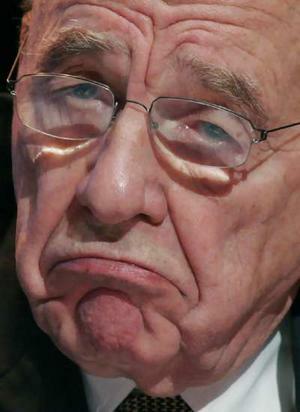 Lesser mortals might have expected a serious set back or two, but for Murdoch – who is already a friend of the dark lord (who partners him natally from the 7th house) – this transit seems to have rendered him more unassailable. Uranus has been hitting all his Pisces-Cancer planets over the past few years and it seems as if Murdoch’s desire to change the media game has not diminished with age. News Corp has developed an innovative on-line newspaper and is in the process of gobbling up all of Sky TV, the UK’s biggest satellite broadcaster. He must be planning to have a super duper 80th birthday, if only to celebrate outwitting both the government and the Monopolies Commission again. I’m sure the British government is making a huge mistake with this Sky deal. I’m afraid that Murdoch is just a hell of a lot smarter than they are – and he has the Neptunian advantage of being able to see the very, very big picture every time. Someone should have told David Cameron: never ever underestimate a Pisces, because you might just be dealing with a whale not a minnow. Fascinating, thanks Christina, I’d been wondering about his chart …. And the next big question is: what happens to all that influence and power when he dies? Yes – he could well pop his clogs when Pluto opposes his natal Jupiter and activates his t-square. I wonder how Neptune going into Pisces will work. Have you looked at Steve Jobs yet? He’s a whale too. I have looked at his chart. He has a really tough grand cross – most unusual. Maybe I’ll do a post about it. This is so good. I love how you explain it and make it all “click”. Despite the darkly fascinating background to the story and the video, this is what I love about astrology when it is so well presented. Thank you. Murdoch’s chart is very coherent when you dig into it. I think that must be one of the reasons he’s so successful. Ah, but Pluto did come to call on Murdoch since this post was written, with the revelations about the U.K. hacking scandal, the division of News Corp. into two companies (one for print and one for entertainment), and then today, with the news that he’s divorcing third wife Wendi Deng. Yup.Even Murdoch gets slammed by Pluto in the end. Very satisfying. I expect he has been organising this divorce for some time and then “blindsided” her with it. Presumably she knows business secrets, so he will have been making sure everything is “water-tight”.